If you’ve been reading PPC Ian for a while, you know that I’ve been a long-time fan of domains. It makes perfect sense as someone who’s now in the commercial real estate industry. I see so much value in owning physical, tangible real property. The same can be said for the real estate of the Internet, domain names. Veteran readers have also likely followed my journey with Epik over the years as a developer, investor, and advisor. Epik is one of those companies that truly transformed the domain industry, approaching domains as investments and treating customers with concierge services. The trend I see more of every single day revolves around excellence in customer service and experience. Offer legendary customer service like Epik, and your business has a true competitive advantage. Section Head at Procter & Gamble: 8-year career at this CPG giant. Founder CEO at Global Market Insite (GMI): Incredible revenue growth (100%+ per year for 7 consecutive years) and a successful liquidity event. Ian: Rob, thank you so much for taking the time to interview here at PPC Ian. I sincerely appreciate the opportunity. Rob: It is my pleasure Ian. I am happy to be with you, as I too am a fan of your work as well and have been able to experience your capabilities first hand. Ian: I wanted to structure today’s interview with questions spanning domains, careers, and the entrepreneurial journey. Let’s start with domains… What’s the latest and greatest in the domain industry? What are the newest trends? I’m hearing a lot about the new gTLDs. How do these affect digital marketers, entrepreneurs, business leaders, and investors? Rob: As you know the latest thing has been the launch of the new gTLDs, or domain extensions. The web is shifting to one that is increasingly semantic, i.e. where the text string after the dot has meaning. For example, very soon, you will be able to type city.menu and go to a site that will show you restaurants in your area, and their menus, or go to restaurant.menu and see that restaurant’s latest menu as well as order food online for in-store, take-out or delivery. This is a good illustration of the potential of new domains. The new registries are just now starting to engage as platform developers and I think the implications of that shift are enormous for the future of direct navigation. For example, I am personally involved in several of platform development projects, including .MENU, .TUBE and .BIBLE. I believe we are just scratching the surface here and that the next 5 years will see the biggest wave of innovation in direct navigation since the launch of the first web browsers. A viable direct navigation framework is critical to the re-emergence of a free Internet, one that is not edited and mediated through search engines. In fact, I think the biggest risk for owners of independent web properties is that search engines are becoming decision engines where sites like Bing and Google simply answer the questions through structured responses, rather than routing you to a list of sites where the searcher has to do the heavy lifting of discerning what is true, particularly in cases where the answers on different sites are not the same as is often the case when doing research. Online brands represent a trust relationship. People who buy domains are buying the raw land for what can eventually be a brand. The launch of these new TLDs represent a new wave of opportunity to create intuitive and clever online brands, as well as networks of direct navigation sites that adhere to a unified brand and to a unified navigation convention. This will not happen overnight, but I think it is the next big thing for the Internet. As for the China domain speculation frenzy of the past year, this seems to have been a flash in the pan, with a binge of speculation by a new generation of domain investors who generally lacked a viable development strategy. Many folks made a fortune in the last year selling short .COM names, e.g. 2-4 character and 2-7 numeric .COM domains that adhere to specific patterns that appealed to Chinese investors. I am pretty sure that has peaked but am happy for the industry windfall. I think the Gulf region will be an interesting region to watch. I am speaking this weekend in Dubai, where I see a whole new generation of savvy domain investors who are looking at domain investment with the intention to develop. Ian: What is Epik? How does Epik differentiate itself from other registrars? Especially interested in your perspective on customer service, and how Epik offers legendary customer service as a core differentiator. This is something I truly admire about your company. Rob: Epik is a full-service and all-inclusive registrar. The term "Legendary Support" actually came from some of our early registrar customers, as did the other more recent Epik tagline "The Swiss Bank of Domains". Before becoming a registrar in 2011, I was a relatively large GoDaddy client. Like most early domain investors I did not have great names. At the same time, I was perceptive enough to realize that GoDaddy had grown to nearly 50% market share while providing what I considered to be poor service with an excessive emphasis on up-sells and hidden charges. The straw that broke the camel’s back was when I signed up for free Domain WHOIS Privacy, only to find out that it was not free after year 1, and that it was a major and time-consuming task to remove the privacy. I wrote an open letter to then CEO Bob Parsons about the experience. When I still saw no remedial action from GoDaddy, I felt it was time for a new registrar to emerge. I absolutely believed in the merits of domain names as an asset class, but it was then that I decided that despite GoDaddy employing many lovely and kind people, their policies were Draconian and the industry needed a compelling alternative. So, it was at that point that I set out to build the best registrar I knew how, providing world class domain management software, and combining that with a passionate culture of service excellence. This has served Epik well. Without aggressive marketing, and without acquisitions, we grew 82% in 2015, our 5th full year operating as an ICANN-accredited registrar. Ian: The Epik homepage describes domains as assets and investments. As an investor myself, this messaging truly resonates with me. Could you please define your personal take on virtual real estate as investments, especially in 2016? Many early investors in the 1990s did extremely well buying generic dot com domains. With that early gold rush being over, are there still opportunities for savvy investors? Rob: I think the domain investment game is changing. The old legacy business model of buying domains and parking them is a broken model. Most of the parking portfolios that do well are actually filled with lousy domain names. As the parking feed providers have continued to squeeze the parking companies, the monetization from parking has become anemic. While we do park some domains, it has never been the emphasis. Going forward, I think the opportunities are mainly in development, whether the domain owner develops, or whether the development is done through partnerships, the value-added comes from using domains, not parking them. And if someone has a viable business, and also has traffic domains, they can even use their traffic domains to drive traffic to their operating sites. Development does require a different skill set, and so if a domain investor is not a developer, then I believe it is in their interest to become effective a networking with others. Deals can be structured as partnerships, or alternatively domains can be leased or financed. In fact, if you look at Epik today, a large portion of our business comes from domain name leasing, and domain name financing. I expect you will see more of this as domains finally come out of the portfolios of the domain investors whose primary competency is managing their parking account. Ian: Those reading PPC Ian are career-minded individuals. You started out at Procter & Gamble and built a successful 8-year career at this CPG giant before starting your first major business, GMI. I’m really curious about your experience at P&G and how it shaped your later years as a business founder and entrepreneur? Do you have any tips for career-minded individuals? Rob: I left P&G on June 12, 1999 after an 8-year career there in Europe and Asia. My last year at P&G I was global product development manager for Pampers. This particular role involved a very great deal of travel to meet with brand teams and technology teams all over the world as part of the process of developing global product strategy. A big part of this process was gathering market research data, a task that would often take far longer than the strategic decision cycles could generally afford. This led me to investigate the possibility of using the Internet as a platform for gathering consumer insight across multiple countries in real-time. When I discovered that the market research industry barely had any comprehension of this nascent technology called the Internet, I decided to leave the day job and move the family to Seattle to start what became Global Market Insite (GMI). I spent the summer of 1999 teaching myself to code in web languages, and began to develop the first versions of what eventually became GMI’s platform for online market research. Years later I did have an opportunity to reconnect with many of my former P&G colleagues. They were still lovely people but there was usually no spark. People in big companies make career by not taking risks and instead complying with an endless supply of internal controls and through consensus-based decision making. I did well at P&G, but by 1999, the entrepreneur in me needed to be unleashed. I still look back very fondly on my early mentors at P&G. It was a great company during those years, attracting some of the best graduates from some of the top business schools. However, for a true entrepreneur, most large corporate organizations will eventually become a challenging environment. As such, I think an entrepreneur should look at the corporate years as being a sort of post-education residency where you have the opportunity to learn how big companies work, and to appreciate what is good about them as well as their various blind spots. As long as the inner entrepreneur is not forced to "sell out", and is being rewarded for their efforts, great. However, by around age 35, you either have made the leap or you have not. I left P&G when I was 32. It was time. Ian: Rob, your experience at GMI was exceptional. Could you please share this story with the readers? What entrepreneurial lessons did your learn growing a company from concept to huge liquidity event? Rob: The process of building GMI was a fantastic experience and in some ways a life’s work. The company was able to secure $2.5 million in Series A funding in 2000, within about a year of starting, and went on to grow rapidly, raising capital at progressively higher valuations, with progressively bigger private equity partners. The final external funding event was a $35 million investment led by Technology Crossover Ventures in 2006. The company went on to be sold in 2011, after I was unceremoniously removed as CEO at the initiative of an activist Board member in 2007. This was actually a very humbling experience that led me on a journey of self-discovery, while also launching a small private equity group of my own called Monster Venture Partners. I think the biggest thing I learned from that whole experience was the consequence of bringing on outside capital partners. Once you do so, as an entrepreneur, like it or not, you have a boss. As a CEO, if you take on external capital, and have Board members, there is a huge expectation to keep the Board informed between formal Board meetings, to build trust and a sense of partnership with them. I frankly viewed my Board as a necessary evil, and despite a continued record of rapid growth, my unwillingness to actively manage my Board ended up costing me the opportunity to take GMI public. The company was instead sold for a 9 figure all cash exit to London-based WPP group, which rewarded all stakeholders. Ian: As someone who’s built successful, large-scale teams, I’d be curious about your leadership and people management philosophy? Rob: Well, Ian, my philosophy has changed over time but there are a few things that I can distill then that you might call a sort of wisdom. I think the biggest thing that I have come to accept is that there is a very important spiritual dimension to things. While I did not grow up with any particular religious faith, through the process of time, I came to the deeply-researched conclusion that the God of the Bible is in fact the Creator of the Universe, and that the decision to accept the free gift of salvation through the Lord Jesus Christ is the path to eternal life. When you have eternal perspective, your management philosophy changes. For example, at an earlier point in my management career, I felt it was easier to be feared than to be liked. However, as a Christian, I choose not to be feared but rather to lead by example, doing the right thing even when nobody is looking. I start each day in prayer. Why? As a sold-out Christian, I am focused on ascertaining God’s will for my life and then acting on that. Since making that decision, I found that Divine Providence has played an increasing role in my life. As a non-Christian, I had very little tolerance for fools and even less patience for rude customers. As a saved man, who has been an active student of scripture, and a tenacious searcher for truth, I now recognize that our battles are won or lost on a spiritual dimension before they play out in this physical dimension. This plays out in unexpected ways, including helping transform the lives of people who have never stopped to contemplate eternity, and are still trying to figure out the meaning of life. And for me, the meaning of life is simply this: to figure out the identity of the Creator and then to figure out what He wants. Once you know this, it becomes progressively easier to manage the resources with which I have been entrusted and to guide the efforts of the diverse and talented group of folks with whom I have the good fortune of being able to work. It also becomes easier to love everyone, including people whose views are different than mine. Ian: One of the things I admire most about you, Rob, is the fact that you are a successful serial entrepreneur. Very few leaders are able to successfully start and grow multiple companies. Could you please share your insights on what it takes to drive repeat success? Rob: The first thing is to have a compelling idea. There is tremendous competition in pretty much any niche, so it helps to have a differentiated idea and a head-start on executing against that idea. There is very little value in being me-too, even if you do it exceptionally well. There has to be an angle that makes you different. At Epik, we have an emphasis on integrating the value chain of Acquire, Build, Manage, and Sell. We also have built a unique capability around domain name leasing and financing. However, at the end of the day, in an era of high competition, a founder must know the product, and know the customer very, very well. For example, even now, as time allows, I still take support calls throughout the day, in order to make sure I know their pain points, and to develop a relationship with a network of what I called "demanding, sophisticated customers". These are not whiny jerks, but rather they are shared stakeholders in building a product and service platform that would make them more effective. They share their ideas, and we quickly integrate those into our development roadmap. The result is what you see today at Epik. By contrast, at DigitalTown (OTC: DGTW), I was brought in as an interim CEO in May 2015 to help turn around a failing public company. Since I had not had the opportunity to run a public company, I accepted the opportunity. Within 6 months, we completely shifted the strategy, and within 9 months had a competitive and differentiated product that has the potential to change the world, particularly as it relates to smaller cities and towns that are struggling to defend themselves against the dual onslaught of big box retail and national ecommerce. Part of the rapid progress with DigitalTown was that we were able to complete an opportunistic acquisition of a development stage company called Cloud.Market which had been developing some complementary technology, and whose founder, Chris Maxwell, shared the same vision I had about the future of local communities, and the tremendous potential of web and mobile technologies to change the way the people in towns and cities engage with content, community and commerce. I very much enjoy the process of birthing companies, and DigitalTown has been a really fun project while also managing Epik as well as some of private equity ventures. I never saw myself getting involved in local politics, but in fact because DigitalTown is build on public-private partnerships, I get to work with some very competent City and County Administrators and Mayors from across the country, and have developed a whole new appreciation for the important role these people play in shaping the destiny of local economies. With DigitalTown, I hope to add some value there. Ian: Sometimes as an entrepreneur, you have to shift gears. You need to adapt. I know Epik’s business model has slightly evolved over time. I’d be curious about this evolution and how you had the foresight to adapt to a changing marketplace, making the right decisions for the company and its customers? Rob: Back in 2009, Epik started out as a platform for mass development. For a couple of years, we had a windfall of a business, growing at 300% per year at one point. This was largely attributable to Google, as we were among the most prolific web developers when it came to developing Exact Match Domains (EMDs). For a period of time, Google would consistently index and rank developed sites that used an exact match domain like IceCreamMaker.com. However, in late 2010, Google threw everyone a curveball by introducing Google Panda. Overnight, sites that were passively earning thousands of dollars per month each, were making just a trickle. And when you have a network of 10,000+ sites operating, the consequences were quite dire. It was at that point that I had to make a judgment decision on whether to try to ride things out with Google, or whether to shift strategy. It was in July 2011 that we closed on the acquisition of the registrar operations of an established registrar called Intrust Domains. That single transaction gave us an ICANN-accredited registrar, as well as a technology foundation, and a highly talented development team. We have not looked back since. In general, entrepreneurs must be nimble and adaptive. When it comes to startups, endurance does not mean beating a dead horse. It means intelligently allocating finite resources until you have a defendable niche, on which you can build a sustainable business. This is a process, not an event. From time to time, most entrepreneurs will stare into the abyss. Some throw in the towel and get a day job. Some lose marriages. Others get ill due to years of excessive stress or poor diet. These are all tragic outcomes. Fail early, fail cheap. Trust your instincts. Scale what works. Take care of your family. Enjoy the ride. Ian: Rob, you are one of the most busy professionals I have ever seen. You are also one of the most responsive too. I think every time I have sent you an email, day or night, I consistently get a thoughtful and thorough response within minutes. And, this is from an extremely busy CEO. I really feel that you take service personally in everything you do. Could you please share your strategy? Any secrets on juggling multiple projects at the same time? Rob: I am a big fan of multi-tasking. Email and Skype are very good for that, i.e. your mind can engage on a multi-threaded basis, which is very hard to do with in-person meetings or with phone calls. Fortunately, I can type quickly. In general, I think technology can be quite liberating if you allow it to be and know when to turn it off. I tend to use technology to my advantage, connecting where I am during waking hours from around 6 am until around 11 pm. In the late afternoon or evening, when I am at home, I can often be found working in our orchard and garden or working on outdoor projects. Mobile Skype on the cellphone serve to keep me connected. And in the summer time, I will finish off some manual labor with a swim in our lake. Downtime is important. My wife, Jill, is a successful family physician who loves to travel. We manage to take 3-4 vacations per year, usually with 1 or more of our 5 kids in tow. When traveling, I will be connected where practical. I have had the same cell phone number since 1999 and a lot of people have it. As such, my cell phone is generally not at my bedside since I am not a fan of 3 am customer calls. For emergencies, a few core people know how to reach me at home. One challenge I sometimes encounter is international travel, most recently a trip to Dubai where I was without an Internet connection for 14 hours. I am fortunate to have a wonderfully talented staff who always step up to the plate, even without being called upon to do so. For the people who work with me, they generally have adopted my pattern of blending work and play. As long as the work gets done, I don’t really care where you did it, what you were wearing while you did it, or how long it took to get it done. What matters is productivity and effectiveness. 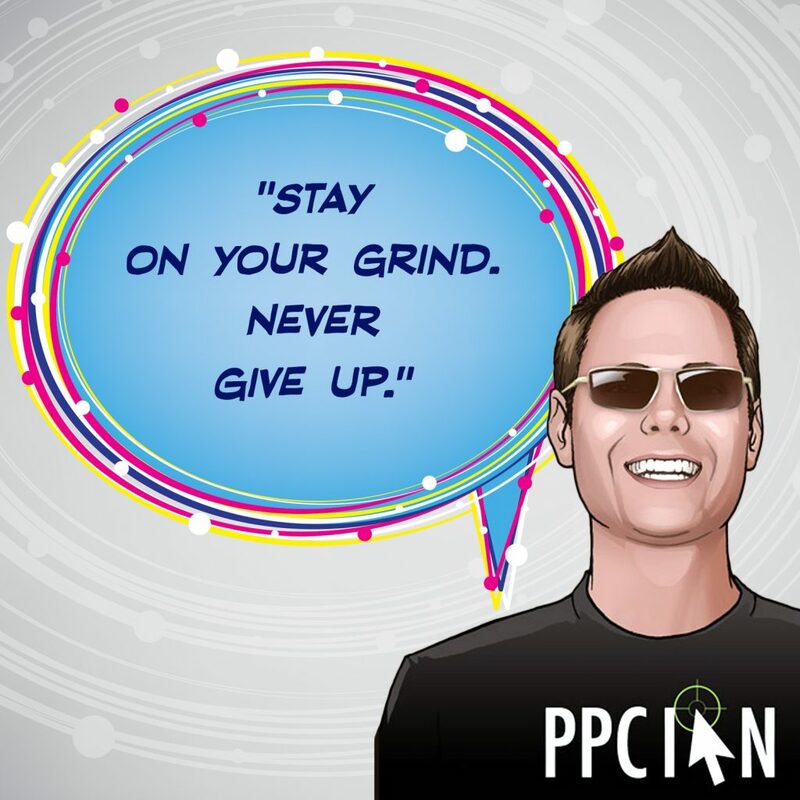 Ian: Rob, I know how busy you are, and wanted to take this opportunity to sincerely thank you for taking the time to interview and share your insights with the PPC Ian community. I personally learned so much from this interview, and I know the knowledge you have shared will help shape many careers. Thanks for everything, it means the world to me and my readers! Rob: Thanks Ian. Always a pleasure to visit with you, and to share insights. Your readers are welcome to reach out to me via email at rob@epik.com or call me directly at 425-765-0077 and I will do my best to provide personally relevant insight for anyone needing it. I am particularly good at helping folks secure domains from others, navigate intellectual property disputes, and recover stolen domains in the unfortunate event that such a thing should happen to anyone. Everyone, I wanted to close out today and encourage you to head on over to Epik. As someone who truly values my digital investments and the best service around, I know you will enjoy managing your domains and digital presence on Epik. If you enjoyed today’s written interview with Rob, I encourage you to head on over to my brand new Video Interview With Rob Monster. Rob actually happens to be CEO of two companies, Epik and DigitalTown. In my video interview, you’ll get to learn more about Rob’s new company, DigitalTown, while enjoying timeless leadership and business insights. I’m a big fan of digital marketing as a career path because the best digital marketers are set up to do anything, including staring their own business or even running a huge business. Why? Sales and marketing skills are absolutely foundational. If you do not know how to sell/market, how are you going to convince people to buy your product, get investors to invest in your company, and influence employees to join your team? Want to test a new sales strategy? Want to test new marketing ad copy? eBay provides the most amazing platform to test anything. I have experienced first hand that great sales and marketing drives more bids and a higher sales price on eBay. While I want to stay humble and keep challenging myself, I feel like I’m an eBay copy master. These same transferrable skills impact everything you do as an entrepreneur. Never stop selling! Certain categories on eBay are hot and others are not. You can’t sell just anything. You need to enter the right market with the right strategy. The same goes for starting a company. You can have an amazing idea, but it’s not going to thrive if the market is just not there. Let eBay teach you market research skills. Research all kinds of crazy markets that you never knew existed. Maybe it will come full circle and eBay will inspire you to start a business in a category you have never knew existed. Are you a risk taker? Do you like to start your eBay auctions at $1 with no reserve, auctioning off items of high value? Or, do you prefer high opening bids with reserves and high buy it now prices? Different strategies work for different situations. Try them all! In my experience, especially if you researched your market well and developed an incredible sales strategy, it’s best to just start with a very low opening bid and no reserve. By taking on risk as a seller you create a ton of bidding and interest in your auction. You likely achieve a higher selling price as bidders fight to win. The same is true for great entrepreneurs. Entrepreneurs need to be comfortable with risk and know when a calculated risk is warranted. When you’ve been selling on eBay for a while, you will have some buyers fall through. You will have an incredible auction that received tons of bids. You will be so happy with your sold price, and ready for your top bidder to pay. Then, the top bidder will go silent and refuse to pay. You may even need to open a "resolution" request with eBay to get things cleared up. That payment may never come through and you may need to run another auction for the same product or offer the product to your next highest bidder via a second chance offer. Selling on eBay is not easy work. You need to be patient. You can never count your money until it’s in your PayPal account. The same is true of any entrepreneur. Start a company today and your payoff may be in ten years. And, while you’re waiting for your payoff, you may face a ton of challenges. Be ready and embrace the challenges! If you’re a one person operation like me you’ll be researching markets, finding the right products to sell, writing ad copy, building your reputation as a reliable and trustworthy seller, creating auctions, communicating with buyers, packing and shipping items, managing your ratings and reviews, and so much more. Entrepreneurs wear so many hats, many more than the eBay seller. However, eBay certainly gives a flavor of what it’s like to wear a ton of hats. Be comfortable wearing lots of hats, this skill will take you far in life and business. You sell your product, receive payment, and ship it to the customer. You’re done, right? No way! It’s all about customer service. In fact, Your Customer Care Is Your Brand, in my opinion. Don’t just ship your item, go above and beyond. Did the buyer pay only for regular mail? Happy with your sales price? Why not invest a few extra dollars (out of your margin) and ship via Priority Mail? Will that impact the buyer? Absolutely! I’m sure they’ll write a glowing review and visit your store often. It’s all about the details and delighting your customer. Entrepreneurial Insight 7: Do you have "street smarts"? I went to Stanford. I know a lot of people that have amazing book smarts. However, do they have street smarts? And, what does this really mean? I think of street smarts as intuition and judgment. When you deal with customers in business, you will hear the most wild stories. Which stories do you trust, and how do you react in the moment? An example: While eBay policy is to pay within 48 hours of an auction closing, buyers will come up with stories on why they can’t pay until later. Do you trust them or not? If you have good street smarts, you’ll know when to trust them. Entrepreneurs need to have book smarts and street smarts. As someone who’s always looking to sharpen my skills, I truly value the testing and innovation done on nights and weekends, after work. If you’re looking to raise your game in business, consider selling on eBay. The insights you learn will make you a better entrepreneur!